Debate on the scope and risks of the US health care plan still rages even as Pres. Obama unveiled a $14 billion plan to help homeowners. And the impact of a Greek bailout on the Eurozone economies is still a question. 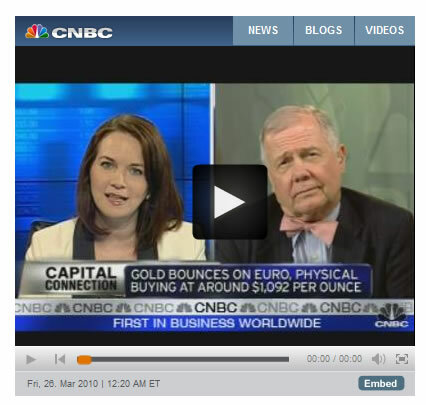 Jim Rogers, chairman of Rogers Holdings, offered CNBC more insights into American and global markets. "All governments around the world are debasing their currencies," he declared. "There may come a time when we all have to have all of our money in real assets." "I certainly own gold," he said. But he pointed out the precious metal's "extremely strong" moves since 2009: "Anything that goes up that far that fast should consolidate and rest." "I like to buy what's cheapest. Silver is cheaper than gold, on a historical basis; natural gas is cheaper than oil." "We see more and more speculation in oil and gold. And in these times, it's usually best to step back and let others speculate." "There's no question that the United States government's long bond is a bubble." "In particular, Hong Kong real estate is nuts," he added.